Writings, observations and ideas either caused by or meant to induce a minor disruption. 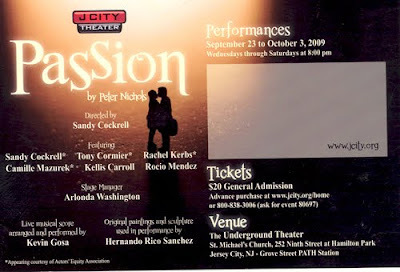 In a few days, the J CITY Theater production of ‘Passion,’ by Peter Nichols, a British playwright, begins in the Underground Theater at 252 Ninth Street. 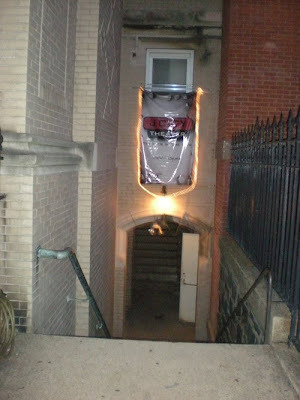 Jersey City’s own off-off Broadway theater company, the “theater” is actually the basement of Saint Michael church. The space is in keeping with the J CITY Theater mission of “Theater in The Raw,” which essentially means unfiltered and pure. Thick drapes enclose the “stage,” a simple living room for the two-act drama, and risers will be used to accommodate the expected audience. 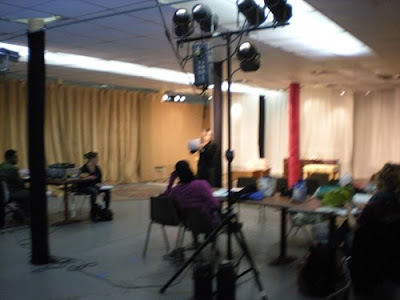 If you have ever been to an off-off Broadway production, than you know how the intimacy and dynamic of a play can be enhanced by an effective use of non-traditional theater space. Passion starts J CITY Theater’s second season in at the Underground Theater at St. Michael’s Church and runs September 23 through October 3. 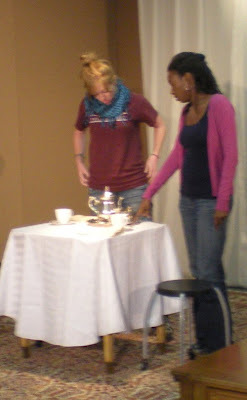 J CITY Theater, a not-for-profit professional theater company based in J.C., has been producing locally since 2006. According to their website, J CITY Theater’s mission is to create quality, high energy theater that is told with sophisticated simplicity. “I want to bring good theater to Jersey City,” said Sandy Cockerel, who serves as Artistic Director of J CITY Theater and is both director and cast-member of the current production. 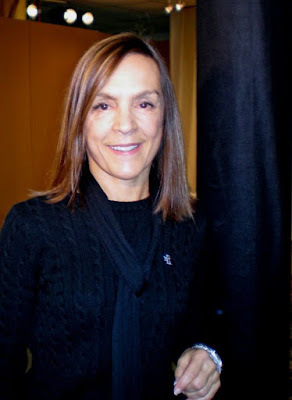 Sandy has about a quarter of a century in theater, which includes a stint as a Drama Professor in Kentucky; for the last 13 years she has worked in the New York/New Jersey area. She told me she has been at preparing this production for about a year, formulating her directorial vision long before auditions began in spring. This contemporary drama received rave reviews when it opened in London. According in The Times, "More than ‘Betrayal’ or ‘The Real Thing, Passion Play’ makes one feel the ugliness of deceit, the escalating anguish that can come from loss of trust. 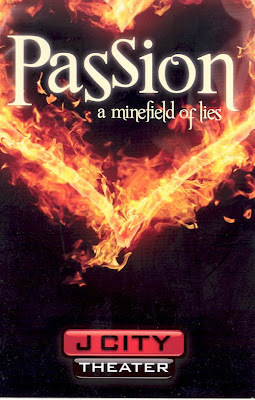 Passion has an intensity of feeling, a moral scope and a theatrical inventiveness that neither of the others matches." I’m not familiar with the play, but even with the minimal googling, it sounds like a gripping drama. I’m even more intrigued however because I was graciously invited to witness a rehearsal on Thursday. It was one of the most fascinating hours or so I’ve ever experienced. Sandy began with four single-spaced pages of notes; which she said took her the entire day. Glancing at the notes as the other actors—and Stage Manager, Arlonda Washington—sat at a table in front of her, Sandy expounded on a series of details. There was give and take. The actors, who scribbled their own notes like honor students, asked pointed questions. There was as much give and take as in a self-help seminar. Most of the concerns Sandy seemed intent on discussing were about internal issues of the characters. She emphasized what she wanted to each actor to think about when saying specific lines and responding to specific lines as well as while moving on the stage. I had the impression that the overall play was going well. 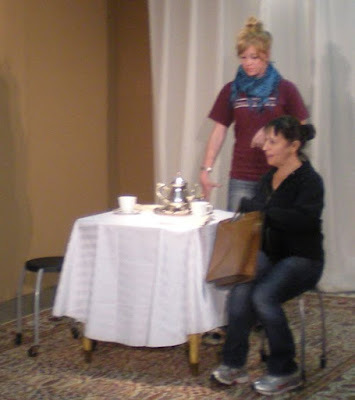 What I was watching was the honing of specific moments in the play. You see a sculpture and say, what craftsmanship. 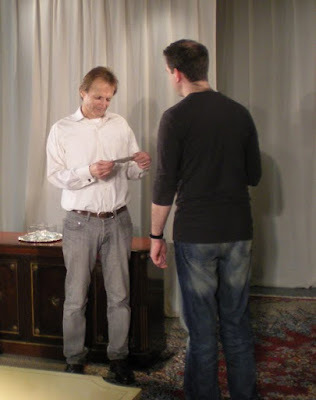 Craftsmanship does not take place with the end result; it is a step-by-step meticulous process and seeing these professionals apply their acting craft—which happened at both the individual level and the collaborative unit that is theater—I found spellbindingly astounding. I watched the actors go over a scene—not a whole scene—it’s a two act play. It was just a portion of the scene. There was a snippet of dialog between characters, and one character had to enter the scene, where during the conversation both characters drink tea (Nichols is a Brit! ), and concludes with one character folding napkins onto a tray with a tea serving set, then picking up the tray and exiting. The lines were repeated what seemed like dozens of time, each one different. Yes a line or two was flubbed, but they were also given different nuances, different emphasis. The actresses were using different expressions on their faces for different readings. Expression, tone of voice, emphasizing certain words and syllables—so that’s why there was so much discussion on the internal in the workshop prior to the scene rehearsal. 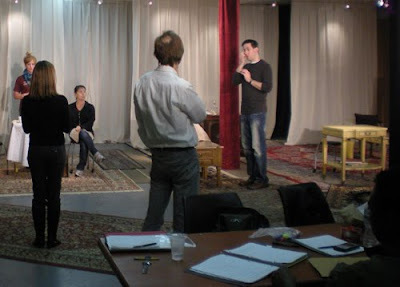 The actors must be the characters in their heads in order to portray the characters in the face and voice. They also went over the movements, again and again. The particulars of the movement was important to the action of the drama, but it was also just as tied the internal life of the characters as their facial expression and line delivery. Jersey City is an isthmus. I live there. Just a guy trying to get by. This blog features stuff I feel like writing about. Hope you enjoy and come back for more.